Rabbi at Ancona in the first half of the sixteenth century. He belonged to a Spanish family which settled in Italy after the expulsion of the Jews from Spain. Isaac was the author of "Megillat Ester," in which he defends the "Sefer ha-Miẓwot" of Maimonides against the criticisms of Naḥmanides (Venice, 1592; Amsterdam, 1660; Berlin, 1733). 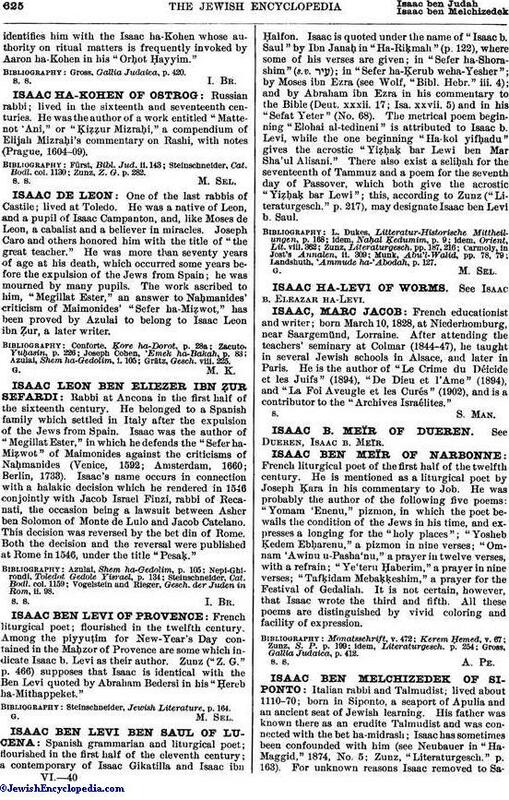 Isaac's name occurs in connection with a halakic decision which he rendered in 1546 conjointly with Jacob Israel Finzi, rabbi of Recanati, the occasion being a lawsuit between Asher ben Solomon of Monte de Lulo and Jacob Catelano. This decision was reversed by the bet din of Rome. Both the decision and the reversal were published at Rome in 1546, under the title "Pesaḳ." Vogelstein and Rieger, Gesch. der Juden in Rom, ii. 98.